Yesterday I received a sad news. 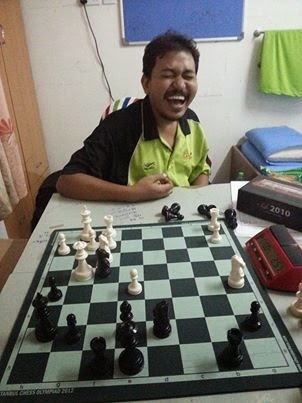 Ahmad Fadzil Nayan , national chess player has died at 9.08 pm in Hospital KPJ Ipoh . The cause of death as informed to me was a heart problem . I do not know Ahmad Fadzil Nayan personally . But as a chess player , I always follow his progress . What I can say is Fadzil is a very potential player that have a bright future in chess . Last year , he represented the country and excels at the Tromso Olympiad in Norway . He continued his stellar performance in the Malaysian Open , where he managed to draw in Round 1 against the eventual champion - GM Zhang Zhong . However, when his performance is making a huge progress, he was feeling unwell during the Malaysian Open and was taken to the hospital . He then withdrew from the tournament because of his critical condition. After several weeks in the hospital , he was allowed to leave. Many of his friends who visit him in the hospital and friends who see his photos realize that it will be difficult for Fadzil to return to play in competitive chess . Four months after he was diagnosed to have heart-related problems, Ahmad Fadzil Nayan passed away on January 18, 2015 at around 9:08 pm. As a person, Ahmad Fadzil Nayan never lack with his smile. Win, lose or draw he will always smile . My personal record with him is 2-1 . He won two and I won one. My single victory was a win on time when I had a totally losing position. At the end of the game I apologize to Fadzil for not winning it "properly" but Ahmad Fadzil Nayan with his typical sincere smile said - no problem. Always smiling and cheerful either win, lose , draw , well and unwell . Ahmad Fadzil Nayan that I known . May God forgive him, have mercy on him, ease this calamity on him and place him in paradise.